I really like the black and white with the colorful font--it reminds me a lot of the hardcover edition of Everybody Sees the Ants. And, as King points out on her blog, the model's hair is very cool. Graduating from high school is a time of limitless possibilities—but not for Glory, who has no plan for what's next. Her mother committed suicide when Glory was only four years old, and she’s never stopped wondering if she will eventually go the same way...until a transformative night when she begins to experience an astonishing new power to see a person’s infinite past and future. 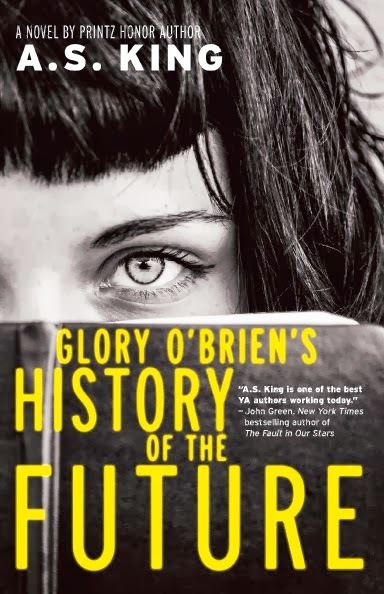 From ancient ancestors to many generations forward, Glory is bombarded with visions—and what she sees ahead of her is terrifying. The book will be out in October! What do you think of the cover? I have never read this author. Good?